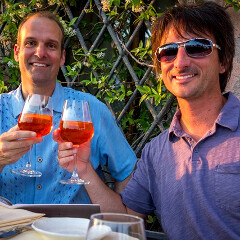 As should be after all major announcements, Microsoft's Joe Belfiore and Chris Shields from Nokia sat down at the drinking dinner table and gave reporters some pep talk on the Lumia 1020 and Windows Phone is general. It turns out that Microsoft has been very actively involved in the creation of the Pro Camera app, and it should have, since it required some deep code diving into the WP8 dungeon that Joe Belfiore is intimately familiar with, in order to ensure the dual full-res and 5 MP PureView picture-taking ability. He also had to rewrite some more general things like the zoom limits in the gallery app, to accommodate for the giant 38 MP full-res photos, for instance. The other interesting part is that the ever-flamboyant Chris Shields hinted, just like CEO Elop yesterday, that there's more where that came from, and promised at the end: "Yep, as amazing as this is, we still have some stuff up our sleeves. We’re not gonna sit still, " making us wonder whether the next major announcement from Nokia won't be the phablet we saw recently, or a Windows-based tablet. Hit the link below for the full interview if you are interested in the rest of the pep talk. The Lumia 1020 has a mind blowing camera and crushes everything on the market, but the price tag is too damn high. For $299 on contract, that phone better receive full software support for the the length of the contract. price should have been 250, just like s4. My hi Ch is that it's priced high because they haven't made many and don't plan on selling more than what they've made before the next awesome successor debuts. And/or it's the new standard for top-shelf phones. I hate these two companies being in bed with each other so much! Anyway not much Nokia bring to the table can beat the imminent flexible displays by LG and Samsung but even still I'm excited to she what Nokia bring! You are right, you do hate these two companies. Nokia has also demoed flexible devices, just like LG and SS, but it's hard to see that with your ignorance spectacle on. Hahaha I do not hate these two companies if you read my comment retard I hate them both partnering together like they are and also I don't see any rumors of a Nokia flexible display coming to the market do you? Its one thing to show a screen of but another to mass produce and that is what LG and Samsung are doing! Idiotic Nokian! We'll talk when they do mass produce them. Right now, they are all in the same league. As for the rumors, you can never tell. Before 808 launched, no one had any idea such a device will be launched. u idiot.. check on youtube and type 'nokia demoed flexible device prototype' u can see lot more feature. since that was just a prototype..u may see many faults! i smell eos2(comes with fhd n quadcore).wat you say guys? Yep, in around 3-4 months. S800, 4.7 inch, 41mp w/ OIS. Hardware wise, the best phone EVER made. Yeh it will be released in 3_4 months.....so everyone who bought the EOS will be ripped of!.....HTC did that game plan and look wat happening to them! If they are real easing a EOS 2 at least wait 8months maybe more! dude.. nokia is not apple or samsung and they can't rest. if 92x had sold really good, do you think they would have released this phone? i think not. But because most people don't care much about nokia, it leaves nokia no choice but to flood market with devices, even if it hurts anyone. For once, I'm with Hoyton. The 1020 was just released, and buyer's remorse is not a card Nokia can afford to play. Whatever they release this fall, I seriously doubt it will have a 41 MP camera. They'll flood the market with other classes of device (a 92x replacement flagship, a phablet, tablets) but the 1020 should be their supercamera for around 9 months. every company fills the market when they are not getting sales, its not pretty but that is the only option. remember samsung before galaxy s? nokia is going through similar phase. i'll repeat: their only option is to flood the market. Yeah, but Samsung didn't release the S3 right on top of the S2. They wait a year between iterations. I think Nokia has more to lose than gain by releasing, say, a Lumia 1040 three months after the 1020.
i know, but ss can do that now, because they are the top players. i was talking about when galaxy s was released. It would still piss off early buyers if Samsung released the S800-packing S4 in the US today. They can get away with that crap back home, but here it would be a marketing faux pas. exactly.. i remebered what happened to samsung before galaxy series. samsung released this,that etc etc..gosh dozens and dozens phones and each of them failed infront of nokia. now nokia is going from the same path, they will have to flood the market!